Only 3 weeks until the ISTE11 conference kickoff with Mario Armstrong! OhEmGee, I am SO excited! Besides being super busy with with ISTE Board service, meetings, poster sessions, Blogger cafe hanging, and playgrounds - I'll be presenting twice on two exciting (but very different!) panels! !! Learning Tools Family Feud: Crowdsourced Edition with Geek Tribe pals my dear mentor the amazing Joyce Valenza, super cool & smart Shannon M. Miller, slick Chad Lehman, hilarious & high-energy Nick "The Nerdy Teacher" Provenzano, and the wonderously sweet & funny Matthew Winner! With our special game show host the AWEsome Steve Dembo! Survey Says! This is gonna be GROOVY! We're gonna re-visit the favourite 70's Game Show with a Twist! We've crowdsourced the survey with over 100 of our PLN answering questions using a Google Form and will be going head-to-head boys against the girls to see if we can guess what the top learning tools will be AND give on the spot examples of how to utilize those learning tools in the classroom! And yes, we will be in COSTUME! Thanks to Shan, Some of our favourite vendors have even promised to donate some cool swag for FREE PRIZES! Including stuff from: Shmoop, Edmodo, SweetSearch, FableVision, EasyBib, Discovery Education (Thanks Steve!) Safari Montage, Terinery Brothers, Snag Learning and I scored a Livescribe Pen to give away! (Thanks Janet!) Please add us to your planner! 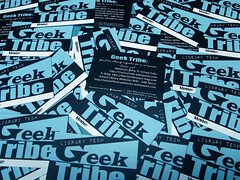 Monday, 6/27/2011, 12:45pm–1:45pm PACC 103BC We've had some very generous donation from some vendor friends to have some prizes to give out during the "Game Show" This preso will be also be broadcasted on ISTEVision! So, if you can't be there in person you can catch it virtually by visiting via ISTE Remote or our TL Family Feud Wiki! Oh and to keep things honest and to ensure the integrity of this event our game show judges will be Diane Cordell and Paul Wood. Anita Beaman: The E-volution of Books: Ebooks, E-readers and the Future of Reading or, Where Are We Going and Do I Have to Get in That Handbasket? Cathy Jo Nelson: The Blind Leading the Blind: Be the trailblazer for newbies, veterans and students alike modeling the use of new tools for professional development and student learning. Gwyneth Jones: Viva La Social Media Revolución! Make a daring digital shift for your practice & the community. Shannon Miller: Be the change you want to see: Empowering students with a VOICE in education. You PLN Comes Alive & Together at ISTE! 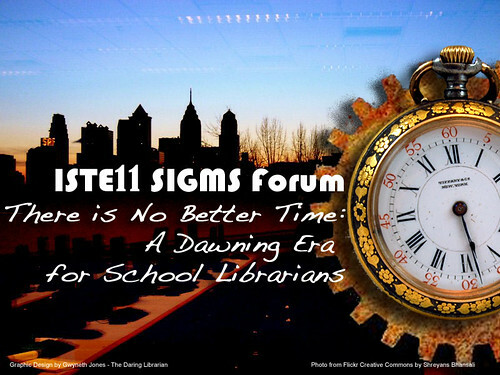 If you're going to ISTE please join us for the learning fun! If you're a reader of this blog I'd love to meet you face to face! If you see me (and forgive me if I'm ISTE blind -where my ADD kicks in and I seem oblivious because I'm too over stimulated! LOL) make sure to come up & say HI!!!! That's my favourite part of ISTE is meeting people F2F I've only "met" virtually here...or on the Twitters! As a member of the ISTE board lemmie officially say that I hope all newbies to ISTE feel welcome, get all they can out of the many awesome offerings at ISTE, and have FUN doing it! I'll be posting soon about my advice to get the most out of the conference experience and packing tips! If this is your first ISTE do make plans to drop by and hang out in the Newbie Lounge on the 3rd floor -it's a great chance to meet other newbies & veterans, learn about cool receptions and events and make friends! PS. to my ALA peeps... I am SO disappointed that I won't be able to join you in New Orleans & go to the Movers & Shakers luncheon (Waaaaa!) ...WHY OH WHY do they schedule these two conferences ALWAYS the same week every year!?? At least next year in CALI we'll be physically closer together so maybe I can hop over! But being on the ISTE board I do have responsibilities and I take those seriously because I'm so honored to represent and serve ISTE members the PK-12 educators! So ISTE will always come first....Cheers dears! !